We offer medieval flasks from different cultures in this category. We have Celtic flasks, Gothic flasks, Scottish flasks, Northumber flasks, and medieval flasks just to name a few. 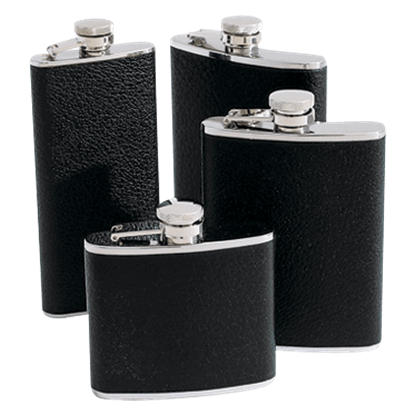 Our flasks come in a variety of shapes, including kidney flasks, round flasks, hip flasks and Q-bic flasks. 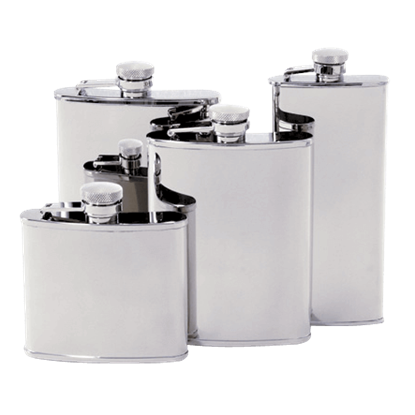 Most of these flasks are made of pewter to keep their gorgeous appearance during use, but we also carry stainless steel flasks. Our medieval flasks are great to take to Renaissance fairs or medieval reenactments to quench your thirst in the hot sun or after a sword fight. 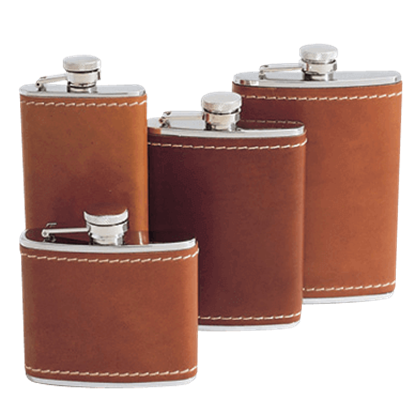 We offer versatile and undecorated plain flasks, while others are stamped or engraved with medieval and Celtic designs. What is a gentleman to do when he wants to take his libations with him? Turn to a flask, of course! A flask is the accessory to have when you want to bring your drink with you, and this 4 oz. Black Bison Leather Flask does just that. A handy flask allows you to take your favorite beverage with you no matter where you go, and this 4 oz. Stainless Steel Flask is nothing if not iconic, thanks to the distinctive shape and the fine mirror polish that makes it gleam. What is a gentleman to do when he wants to take his libations with him? Turn to a flask, of course! A flask is the accessory to have when you want to bring your drink with you, and this 4 oz. Tan Bison Leather Flask does just that. What is a gentleman to do when he wants to take his libations with him? Turn to a flask, of course! A flask is the accessory to have when you want to bring your drink with you, and this 5 oz. Black Bison Leather Flask does just that. A handy flask allows you to take your favorite beverage with you no matter where you go, and this 5 oz. 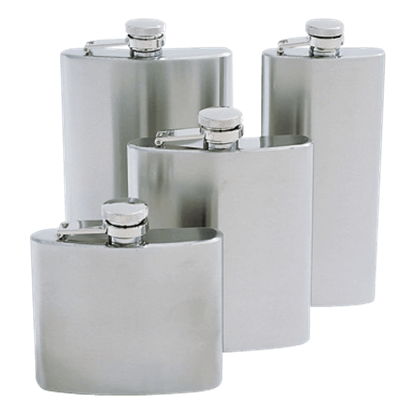 Stainless Steel Flask is nothing if not iconic, thanks to the distinctive shape and the fine mirror polish that makes it gleam. A mirage is an illusion, something you see that is not really there. In the case of this 5 oz. Steel Mirage Flask, it is something different. This flask has the look of a traditional design, but it features a larger capacity. What is a gentleman to do when he wants to take his libations with him? Turn to a flask, of course! A flask is the accessory to have when you want to bring your drink with you, and this 5 oz. Tan Bison Leather Flask does just that. A mirage is an illusion, something you see that is not really there. In the case of this 5.5 oz. Steel Mirage Flask, it is something different. This flask has the look of a traditional design, but it features a larger capacity. What is a gentleman to do when he wants to take his libations with him? Turn to a flask, of course! A flask is the accessory to have when you want to bring your drink with you, and this 6 oz. Black Bison Leather Flask does just that. A handy flask allows you to take your favorite beverage with you no matter where you go, and this 6 oz. Stainless Steel Flask is nothing if not iconic, thanks to the distinctive shape and the fine mirror polish that makes it gleam. What is a gentleman to do when he wants to take his libations with him? Turn to a flask, of course! A flask is the accessory to have when you want to bring your drink with you, and this 6 oz. Tan Bison Leather Flask does just that. A mirage is an illusion, something you see that is not really there. In the case of this 7 oz. Steel Mirage Flask, it is something different. This flask has the look of a traditional design, but it features a larger capacity.